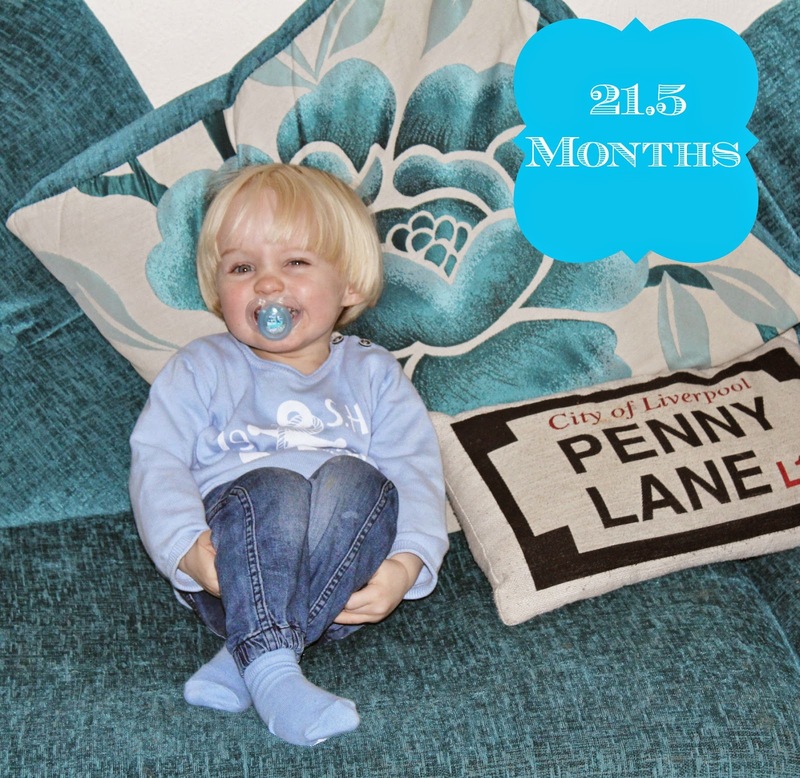 Mummy seems to have completely missed out your 20 month update....so we're doing your 22 month update a couple of weeks early instead! Your last update was at 18 months, and oh my goodness how much have you changed since then! I know I sound like a broken record as I say this every time I write one of these updates, but you grow and change so fast it's unbelievable. Your eating is one thing that hasn't really ever changed. You've always been a really good eater, you love your food and so far you've never shown any signs of fussiness. There's very little that you don't like food wise - the only thing I've ever found that you refuse to eat is cucumber (Weird, as Mummy can't get enough of it!) but you're great with everything else. Infact you eat lots of things that surprise me, I was such a fussy eater as a child so it really surprises me to see you love foods like mushrooms which I would never have touched when I was little - but you LOVE them! You always ask for "more mush!" whenever we have them, and you're a big fan of peas and brocolli too - always asking for more! Your other favourite foods are "Curry & Rices" which you ask for a lot, crackers, cheese, "Sketti Hoops" and lately you've been asking for "ices" a lot...you discovered the fun of crunching on ice after you shoved your hand into my glass of water once day and pulled out a piece, and now you love it! You definitely get that from me, as I love crunching on ice too! As for sleeping, we've taken a bit of a step backwards in this area I'm afraid! At 18 months you were happily asking to go to bed at 7.30 - that seems like a long time ago now! These days you try to refuse bedtime...you always insist that Daddy takes you to bed but you mess around for at least 45 minutes before going to sleep - you're rarely asleep before 9pm, and then you usually wake up a few times before midnight too needing a bit of comforting. It's strange though as when we were visiting Liverpool last week and Daddy wasn't there, you happily let Mummy take you to bed and fell straight to sleep with just a quick cuddle and never woke up in the night once! So I'm not sure what's different about being at home?! Your speech always amazes me. You come out with new words every day and most of the time I have no idea where you heard them! You're also speaking much more in sentences lately too, and we can now have a proper chat with you. Infact you regularly say "Talk!" which means that you want to sit and have a chat! You're a real little chatterbox! Today you asked where your favourite dummy was, and when I said I didn't know....you replied "Probably I dropped it"...and went off looking for it in your room! I had no idea you knew the word "Probably", let alone how to use it properly! There are a few things that you say that make me a bit worried though - you say "Sorry" a LOT....even when you haven't done anything to say sorry for, which makes me and your Dad a bit worried as we don't want you to be someone who is always apologising without having done anything wrong! We're hoping its just a phase and a favourite word for some reason. You have also started to say "Scared of!" a lot....whenever you see something you're not sure of, you run to me shouting "Scared of! "...it can be any number of things. You regularly said you were "Scared of" your cousins when they were being loud at nannys last week, and you also told me you were scared of people! On the other hand, today you told me that you were "scared of" the tree outside, the birds and your Thomas train....so I'm thinking it may just be a newly discovered phrase and you're not actually associating much meaning to it! Well this is certainly a milestone that I did NOT expect to be writing about any time soon! But for the last 5 or 6 weeks you have been telling me that you needed to go before you have done anything in your nappy. I did wonder if this might be a sign that you're ready for it but I told myself that you're far too little yet and ignored it. Then last week, you told me you needed a poopoo...then you said "Toilet"...I asked if you wanted to go to the toilet and you said yes....so I decided to sit you on there just to see if you did anything....and you did! I was very surprised but I thought it would just be a one off. Since then though, you have been asking regularly to go to the toilet and every time we put you on...you do something! You then always say "Toilet....good!" and clap for yourself! You seem to only ask to go to the toilet of an evening though, and still go in your nappy without telling us during the day. But I think that when your current pack of nappies runs out, I'll buy some pull ups and we'll see how we get on! Since our last update, we've had a few trips to Liverpool to see Nanny & Gagand. We went there for Halloween which you really enjoyed, and we went last week just after Christmas to visit Nanny after her recent hip replacement operation. Christmas was a lovely time, and we did lots of fun things in the run up to it too - such as taking a trip on the Polar express, going to see Santa and going to the German christmas market where you saw the reindeer and enjoyed a train ride! We also celebrated New Year by going out for a nice meal, unfortunately you didn't quite make it to midnight though! We've got a little holiday to Bluestone National park coming up at the end of January which we're excited about, as it will most likely be our last holiday as a family of 3 before your baby brother arrives! We've made plans to go swimming once a week with Aunty Laura & Kier, which will be nice and I have booked us in to start Music With Mummy classes locally from next week. I've been looking in to signing you up for some dance classes but they don't start until the age of 2, so we'll stick with the Music with Mummy class until then! I really want to try to fit in a trip to Thomasland at Drayton Manor as I know you'd love it, but I'm not sure if its something we'll do before the baby arrives as I'd like to be able to go on the rides with you and they probably won't let me at the moment! I've also been planning out your 2nd birthday celebrations - eeek! I think we'll be hiring out a soft play centre as your birthday is a week before your brother is due to arrive so I want something that will be all taken care of even if I end up in hospital early! We have most of your presents already, there's just one main gift left that I want to get for you! I think that's all our news for you, your next update will be in 2.5 months time when you turn 2!! Oscar is good with his food and will eat anything except for cucumber too. Which is odd as both me and Stacey would live on it if we could :p And he's also started waking up around midnight for cuddles. Something he's never done before as he's always been a good sleeper. I'm hoping it's just a phase. What a head of hair on that kid! He's awfully cute. I don't suppose you can keep him that age. fab pics! they do grow up so quickly, I have the Abbey Road cushion also! Oh Bless.. That is so Cute. My Niece is 17 months and she loves a Chat.